Be the first to share your favorite memory, photo or story of Bessie Virginia. This memorial page is dedicated for family, friends and future generations to celebrate the life of their loved one. 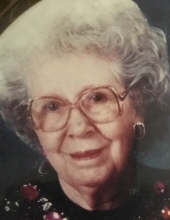 Bessie Virginia Coleman McClanahan, 94 years of age, of Hurley, VA passed away on Friday, January 18, 2019 at Heritage Hall of Grundy, VA. Born February 21, 1924 in Hurley, VA, she was the daughter of the late Walter and Rosa Matney Coleman. Bessie was of the Freewill Baptist faith, a loving mother, grandmother, great-grandmother and sister. In addition to her parents, she was preceded in death by her husband, Earl McClanahan and two brothers, Charles Coleman and Major Lee Coleman. Those left to cherish her memories include her daughters, Donna (Thomas) Cantrell of Lynchburg, VA, and Sue Potter of Troy, VA; sons, Walter Carl McClanahan of Grundy, VA and Richard Earl (Peggy) McClanahan of Hurley, VA; sisters, Maude McCoy and Iveris Justice both of Hurley, VA; brothers, Ulvert (Marie) Coleman of Hurley, VA and Lucas Earl Coleman of Tazewell, VA.
She is also survived by five grandchildren, three great-grandchildren and numerous nieces and nephews. The family will receive friends at the Word Evangelistic Outreach Church of Hurley, VA, Tuesday January 22nd and Wednesday, January 23rd after 6:00 p.m. with evening service to be held at 7:00 p.m.
Mrs. McClanahan's body will be moved to the Shortridge-Ramey Funeral Home Chapel of Grundy, VA, Thursday, for her funeral service at 1:00 p.m. The family of Bessie Virginia Coleman McClanahan have entrusted the care of their loved one to Shortridge-Ramey Funeral Home of Grundy, VA.
"Email Address" would like to share the life celebration of Bessie Virginia Coleman McClanahan. Click on the "link" to go to share a favorite memory or leave a condolence message for the family.